Cardiac chamber enlargement refers abnormally large atria or abnormally large ventricles. These conditions are referred to as atrial enlargement and ventricular enlargement. From a hemodynamic standpoint there are two types of enlargement, namely hypertrophy and dilatation. Both hypertrophy and enlargement may reduce atrial and ventricular function as well as predispose to significant arrhythmias. Typically, atrial enlargement predisposes to atrial fibrillation/flutter and ventricular enlargement predisposes to ventricular tachycardia. The ECG is a useful tool for detecting hypertrophy/dilatation but echocardiography and magnetic resonance imaging (cardiac MRI) are superior to the ECG in terms of sensitivity and specificity. Nevertheless, to detect hypertrophy/dilatation using the ECG, a wide range of criteria and algorithms have been developed over the years. Most of them are easy to use and requires very little calculation. Sensitivity and specificity varies markedly, as discussed in detail in the articles on left ventricular enlargement, right ventricular enlargement and atrial enlargement. Below follows a discussion on the principles and differences of dilatation and hypertrophy, as well as typical ECG changes seen in atrial and ventricular enlargement. Volume overload (diastolic overload) causes increased pressure within the chamber and this leads to dilatation. The most common cause is valvular regurgitation (insufficiency). For example, aortic regurgitation causes flow of blood from the aorta back into the left ventricle during diastole. The flow of blood into the ventricle causes volume overload, which exhausts the ventricle and ultimately leads to dilatation. Pressure overload (systolic overload) implies that there is increased resistance across the aortic valve, making it more difficult to pump blood into the aorta. The most common causes are hypertension (in which the pressure in the aorta is increased) and aortic stenosis (in which the narrowing of the opened aortic valve orifice makes it difficult for blood to flow from the ventricle to the aorta). Hypertrophy manifests on the ECG as increased amplitudes of the QRS complexes. The explanation is straight forward: myocardial muscle mass is increased and therefore it generates greater electrical potentials. However, a dilated chamber may also bring about increased QRS amplitudes. This is because large chambers may be positioned closer to the electrodes (chest leads) which therefore observe stronger electrical potentials. However, severe dilatation (late stages) is usually associated with poor ventricular function and lower QRS amplitudes. Hypertrophy and dilatation may coexist. Moreover, the ECG cannot distinguish whether large QRS amplitudes are due to dilatation or hypertrophy. Because the majority of the litterature in the field of electrocardiology has focused on hypertrophy, the remainder of this discussion will only concern hypertrophy. Hypertrophy may cause a slight prolongation of the QRS duration because it takes longer to depolarize the large ventricular mass. It does not, however, reach 0.12 s (such significant prolongation is due to intraventricular conduction defects). Hypertrphy may also shift the electrical axis (to the right in right ventricular hypertrophy, and to the left in left ventricular hypertrophy). Significant hypertrophy may result in abnormal depolarization of the ventricular myocardium. This is presumably due to a mismatch between the expansion of contractile cells as compared with conduction cells. Therefore it is very common to observe secondary ST-T changes, characterized by ST-segment elevations and ST segment depressions. 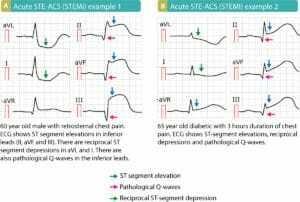 These elevations and depressions are discordant to the QRS complex (a negative QRS is followed by positive ST-T segment and vice versa). The ECG may provide strong, but never conclusive, indications on hypertrophy. It is important to be able to recognize these ECG changes because hypertrophy is associated with adverse cardiovascular outcome (increased risk of heart failure and arrhythmia), even though the patient may be asymptomatic for several years. 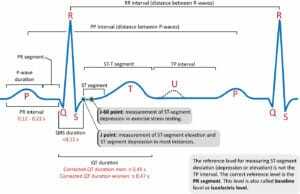 Whenever the ECG shows sign of hypertrophy (atrial or ventricular) it is recommended that the patient be referred to echocardiography in order to elucidate cardiac function and structural characteristics. A long list of ECG criteria (which, in the context of hypertrophy, are referred to as index) have been developed and validated over the years. All these index have low sensitivity (virtually all <50%) but very high specificity (many around 90%). This implies that the ECG index will only detect less than 50% of patients with hypertrophy; but whenever the criteria are fulfilled it is very likely that the patient actually has hypertrophy.